Every suite at Le Toiny has its own private heated pool with ocean views. Raise your red flag at your gate to ensure no interruptions; a 'do not disturb sign' which has become famous around the world. All suites have their own private entrances, terraces and gardens, allowing you to sunbathe and relax in private with direct views of the sea and the sound of the ocean. Breakfast can be served on the terrace, set up at a time of your choice. 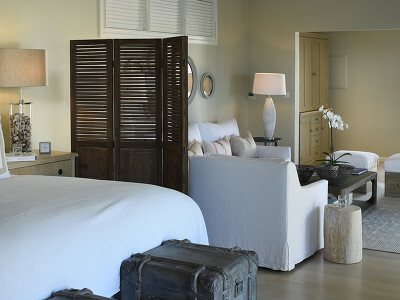 The Junior Suite is one large room with large bay windows throughout the suite offering Caribbean views. Each Junior Suites' interior features a desk, kitchenette and a full-size sofa, bespoke stools, armchair and fabrics. Adjoining bathrooms are spacious, with a bath, open shower and dual basins. The Junior Suite offers a terrace with a private pool and a partial Ocean View. 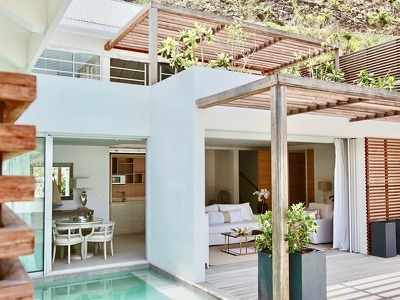 Each of the one-bedroom Villa Suites is completely secluded, offering an ideal balance of privacy and luxury. Living and bedroom areas are separated by sliding partitions with large bay windows throughout the villas offering Caribbean views. Each Villa features a desk, kitchenette and a full-size sofa, bespoke stools, and armchair. Adjoining bathrooms are spacious, with a bath, open shower and double basins. Each Villa has an expansive terrace with a private pool. Newly opened in October 2018 these suites are located on the hillside. The Spirit Suite has a separate sitting room with sofa, armchairs and writing desk as well as a kitchenette and large terrace. The private has a stunning view of the Caribbean. The en-suite bathroom has both a bath and a separate shower as well as double basins and there are plenty of gorgeous bath and body products from Bamford. Newly opened in October 2018 this 2 bedroom Suite features a large private pool and full ocean view. The Suite is located on the hillside with a separate sitting room with sofa, armchairs and writing desk. The coastal interiors by Lady Bee Osborne are complemented by contemporary furniture and there's a kitchenette as well as a large, private terrace. The en-suite bathroom has both a bath and a separate shower as well as double basins and there are plenty of gorgeous bath and body products from Bamford. Located on the hillside this suite has a large terrace with private pool and ocean views. The coastal interiors by Lady Bee Osborne are spacious with a separate sitting room with sofa and armchairs as well as a writing desk. The en-suite bathroom has both a bath and a separate shower as well as double basins and there are plenty of gorgeous bath and body products from Bamford. Newly opened in October 2018 these suites are on the hillside and feature a large terrace with private pool and ocean views. The interiors are spacious with a separate sitting room with sofa and armchairs as well as a writing desk. The en-suite bathroom has both a bath and a separate shower as well as double basins and there are plenty of gorgeous bath and body products from Bamford. 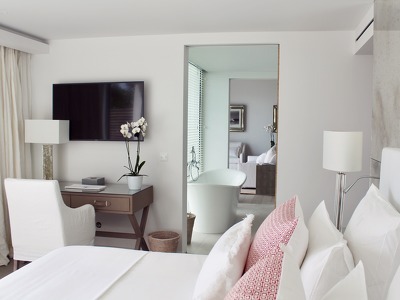 Hotel Le Toiny St Barth is St Barths' most private and exclusive boutique hotel and has recently gone through a stunning renovation. It has now re-opened to welcome guests in its 22 luxury villa suites which are dotted around 5 acres of palm groves bordered by Toiny beach and the Caribbean Sea. 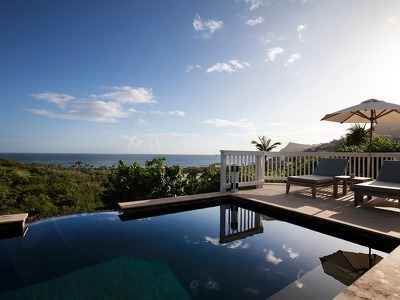 Private and utterly romantic, Hotel Le Toiny with its Serenity Spa Cottage and award-winning restaurant is one of the best luxury boutique hotel experiences on St Barthelemy. Children can, of course, join their parents for a visit to Le Toiny, and the hotel often provides them with a small gift on arrival to make them feel all the more welcome. You might simply like to spend your time between the beach and your own private pool, or head to the gym for a personal training session followed by an Elemis massage at the Hotel Le Toiny Serenity Spa Cottage. Yoga and Pilates sessions can be organised on request and can be taken on the private Toiny beach, in the hotel's garden or in the privacy of your Villa Suite. The beach is just a 10-minute walk from your villa and the hotel's boutique sells some gorgeous jewellery, fashion and accessories. Le Toiny Beach Club offers a full beach service to hotel guests and has a bar, shop and shaded beach loungers. A buzzing nightlife is just a short taxi ride away as are the shops of Gustavia and St Jean. Tennis courts and hiking trails are all close by. The hotel shuttle takes guests directly to the beach. Executive Chef Luca Minetti is a magician in the kitchen at the Le Toiny Restaurant, creating elegant but simple dishes. Possibly the best restaurant on St. Barths, the restaurant has been completely redesigned and refurbished with a calm palette of neutral tones and fine natural materials including mother of pearl, soft fabrics and sun-bleached teak. A new open-air oyster shell bar, seating corners and a champagne area give an intimate, romantic beach-chic feel to the re-vamped restaurant, which is known for its innovative cuisine and international wine menu. Alternatively, a private dining experience is offered; eat in your own suite or on the terrace from a menu especially designed to suit your personal tastes. British Airways and Virgin Atlantic both have direct flights from London Gatwick to Antigua. From here, there are flights with St. Barth Commuter and Tradewind Aviation to Gustaf III airport. Airfrance fly direct from Paris Roissy (Charles Gaulle Airport) to St Maarten (Princess Juliana Airport), and Air Caraibes and Corsair both fly there direct from Paris Orly. There are flights from St Maarten to St Barthelemy with Windward Airways and St. Barth Commuter. Air France and Air Caraibe both have flights from Paris Orly to Guadeloupe (Pointe a Pitre- Pole Caraibes). There are flights from here to St Barthelemy with Air Caraibes. For cancellations occurring less than 30 days prior to arrival the deposit will be lost. Any shortening of stay occurring less than 30 days prior to arrival will incur a penalty unless the hotel will be able to resell the space. Arrival and departure transfers from St Barth’s airport or harbour, a bottle of Champagne & gourmet snacks in your Suite upon arrival, full American breakfast served daily on the private terrace of your Suite, one 3-course dinner for two at the hotel restaurant (excluding beverages), two 1 hour spa treatments (available on select treatments only) and a rental car for 2, 4 or 6 days (available on select cars only, excluding gas and insurance). Valid from 15th October 2018 - 31st August 2019 for a 6 night stay for 2 people. private yacht sunset cruise with champagne, one three-course dinner for two at the hotel restaurant (excluding beverages), Gourmet picnic with bottle of wine, Rental car for five days (excluding insurance and gas) and a 60-minute relaxing couples’ massage. Visited for the day to have lunch and shop. The food was excellent and the location was even better. Top notch service. Absolutely worth the ride down the hill in one of their Range Rovers. Nice hotel and great rooms. Service could be better. We have only dined here, but the views were stunning, and the food excellent!